As winter fishing increases in popularity some types of saltwater fishing are also increasing in popularity due their success. Fly fishing is one type this growing due to the overall interest and the fact that the stealthy elements of casting a small fly on a floating line can many times better results. 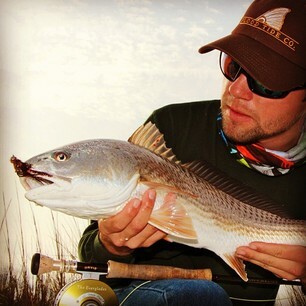 With winter Red Fish being a bit more spooky in the winter due the cooler water temps that drives their appetite. With that in mind the substantially more quite fly and floating line can prove to be more effective as opposed to a top water lure or other spinning lures. On these cooler days simply quietly float around the mud flats around falling low tide and you’ll probably find the Reds schooling up in good numbers. During the winter months they like to congregate in the shallow water seeking the warmer water heated by the sun. This shallow water also provides them protection from feeding Dolphin that come inshore looking to feed. They also like to feed together in schools of 200 fish or more, again as a defense mechanism. Once on the mud flats look for the dark object moving below the surface. Polarized sunglasses are a necessity because winter Red fishing is all about site casting. When you spot your target it’s best to use a trolling motor of anchor spike to stay in the area. Throwing a noisy anchor will only result in spooking the skittish for hours. Even with the lighter and more quiet lure and line it’s best to cast past the sited fish and quietly retrieve your lure back. Remember, the Red Fish’s eating habits are less aggressive in the cooler months, so be patient. 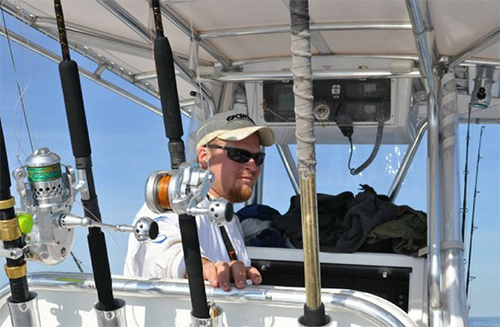 In closing, fly fishing is a growing part of saltwater fishing. If you’ve not tried fly fishing, it may be time. In many ways it takes the sport of fishing to the purest level. It takes practice and is many times considered to an art. It also seems to offer an alternative to using the spinning reel and other means of fishing. Expand your fishing ability and give fly fishing a try. You’ll be glad you did.